Okay, after days of swearing at pieces of fabric and stabbing my fingers with pins, and spending half a day in a mask and headpiece, I've come to the conclusion that there is no practical value whatsoever in dressing up to fight crime or perpetrate villainy. I couldn't blink with the mask on, I couldn't grab anything with gloves (let alone type), my little wrist cuffs kept on falling off, my sleeves rode up, the pants twisted around, and the headpiece got really, really annoying, and the white "face paint" (jerry-rigged white concealer stick, really), got on everything, so I couldn't even touch my face. And even though I wasn't running around, I was wearing heels. Argh! Cosplay is not fun! I can just imagine the joys of dressing up as Wonder Woman. So that got me thinking who has the most practical costume? The best I could come up with was The Question. Just a man in a suit. That's pretty easy to run around in, though maybe not the best for actual hand-to-hand combat. The hat might fall off, too, but no big deal. 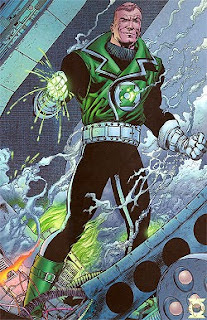 Any Green Lantern can generate his or her costume from their ring, so that's carte blanche to have whatever kind of costume your heart desires. So Green Lantern costumes = practical. So, hooray for these guys. 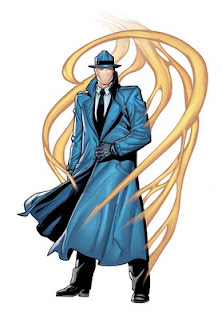 Oh, here's a picture of Vril Dox. His outfit is pretty practical because it's a military uniform. And he's got jodphurs. I like jodphurs. 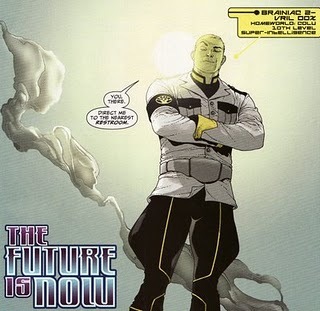 And Vril Dox. You just can't go wrong with real clothes. Which is why Lois has my vote as well. She doesn't go out and punch anybody, but she DOES fight crime! Guy's outfit has always been one of my favorites, and it has the advantage of looking good on just about anybody. Heels and fishnets are NOT intelligent things to wear when fighting crime. Villains have a bit of leeway, as their costumes usually have death rays or something built in. And they have hordes of minions to do their dirty work FOR them, which is awfully handy. 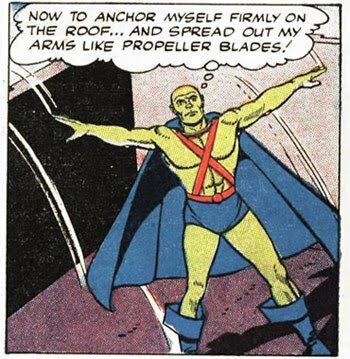 Yeah, Ostrander tried to say J'onn had shape shifting plant clothing, named Zo'ok, or something...Nope, not havin' it. Best MM costume related scene? Justice League Another Nail 2, he's working on the Satellite with Superman, with no cape, they are called away to action, and he simply grows his cape from hi shoulders... LOVE IT. m'gann has confirmed several times in TT that her clothes are part of her. ravager now won't let M'gann sit on her bed. heh. I think superman's military costume whilst on new krypton was pretty practical. oracle's works too! (normal clohtes!) and superboy's, and wonder girl's/ and ravager's for that matter. I was going to say Two Face but then remembered going as him one Halloween, then spending the entire party praying the safety pins holding the two suits together didn't pop open lol. I think apart from the folks already mentioned practicality comes down to a pair of elastic purple pants on the heroes side, unless you can lay your hands on some unstable molecules to sow together. Ahh Reed Richards, scientific genius and winner of Marvel's Project Runway. Good one with Vril Dox up there! Tom Strong (anyone know this guy created by Alan Moore in his own ABComics inprint under Wildstorm and therefore DC Comics?) gets my vote! What d'you think of Metamorpho or Plastic (who also both "generate" their costume since it sort of became part of them). Gotta love Kamandi's oufit - cutoffs, boots, your done. Free and easy!